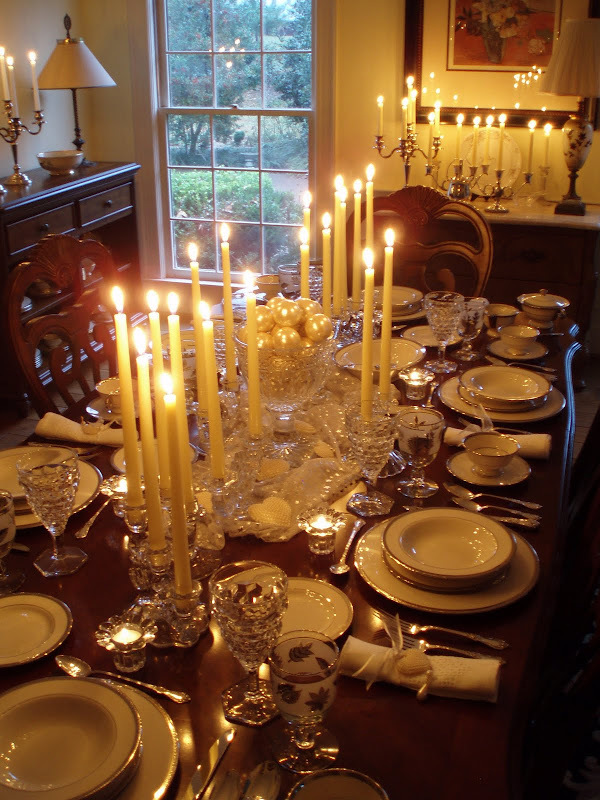 Affordable Accoutrements: Fire & Ice, A Holiday Table! Fire & Ice, A Holiday Table! Congratulations to Nannykim of Spindle Cottage! She's the winner of the Johann Haviland Royal Lace china from my very first giveaway. Thank you to all of you who visited, commented, and are following/subscribing to Affordable Accoutrements. I appreciate all of you more than you'll ever know! 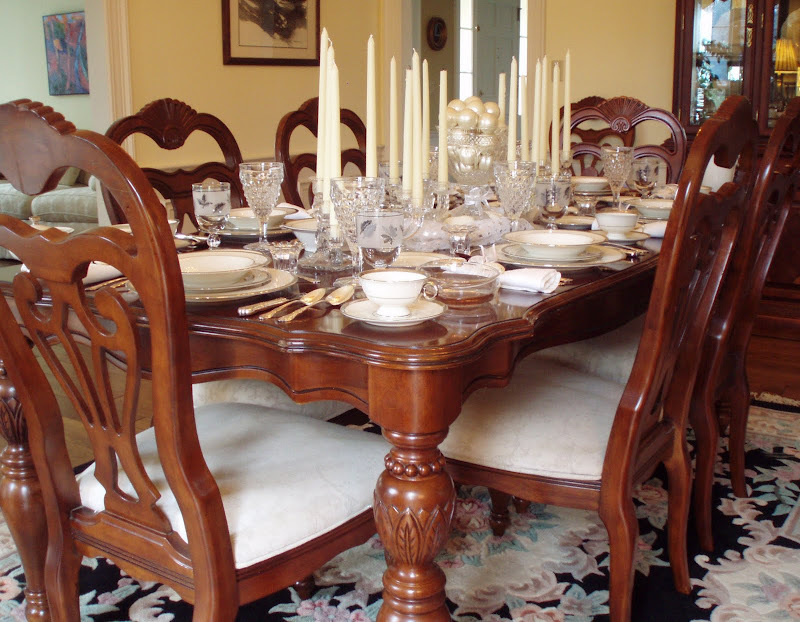 It's time for another Tablescape Thursday with our charming and gracious hostess, Susan of Between Naps on the Porch. I hope you'll visit her beautiful blog HERE and enjoy all the wonderful tables Susan and her friends have created and shared. Today I've set a table for you that features various shades of white and off-white, clear glass for sparkle, and platinum and silver for shine. We're in the dining room on a hazy afternoon. I decided not to use a tablecloth or placemats, allowing the warm woodtones to provide contrast with the lighter elements of the table setting. 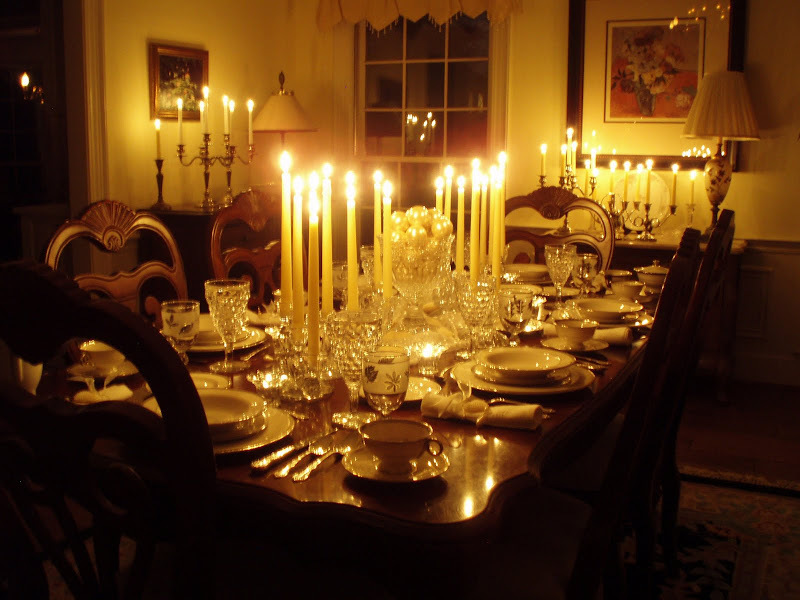 Well ... it seems that the table is set for a special holiday evening. But which holiday? Could it be Christmas Eve? New Year's Eve perhaps? No, it's probably Valentine's Day. Perhaps it's an anniversary party. Let's take a closer look. The ornaments are definitely intended for a Christmas tree. There are faux pearls, hearts, stars ... perhaps a setting like this could be used for any of the above-mentioned holidays. 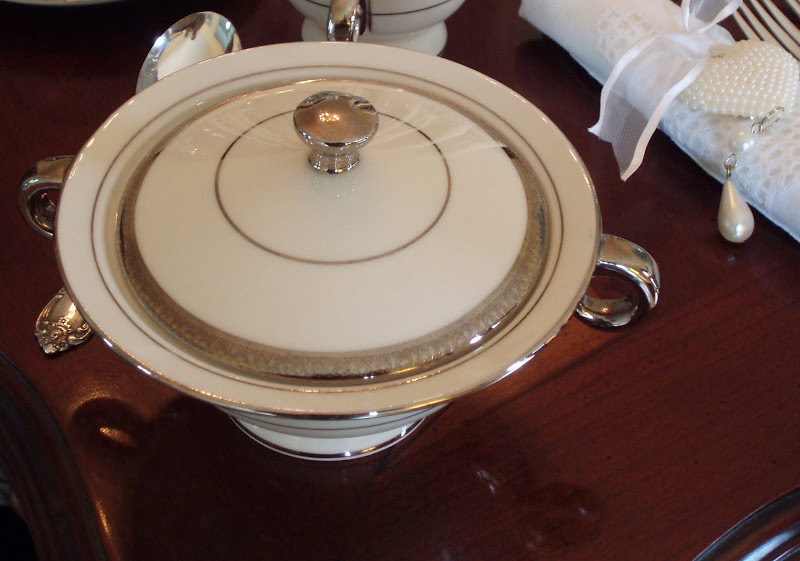 The china pattern is Shelton, by Theodore Haviland (1952-85). 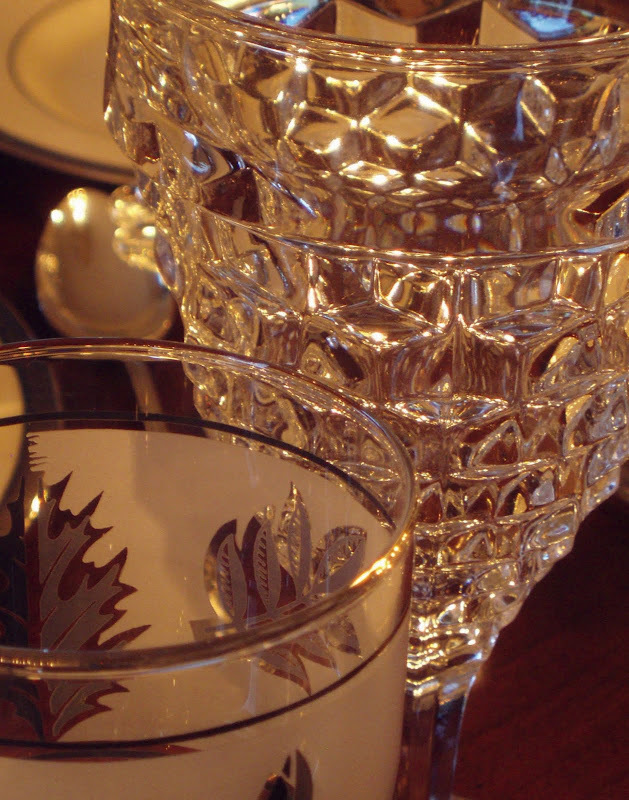 How many of you recognized the pattern of the vintage water glass on the left below? That's right; it's Fostoria's American (1915-82). It's said to be the most successful pattern in the history of glassmaking. The design always reminds me of stacks of small ice cubes ... clear and sparkling. I see Fostoria American almost every time I go to an estate sale or antique shop/mall, in part because the pattern was so popular ... for so long. It's also quite sturdy compared to most of the thinner, more fragile crystal produced during the "Elegant" glassware period. Here's a hint I've found helpful: genuine Fostoria American stemware, a pressed glass product, has three seams in the base. Cheaper imitations have only two. The vintage napkins are rolled and secured with wired ribbon. 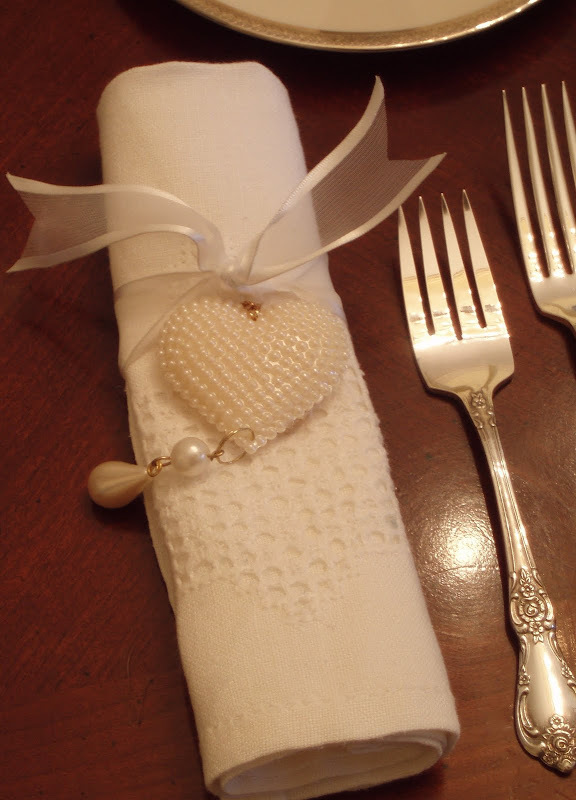 The ornaments on the napkins could be given to guests as a keepsake at the end of the evening. 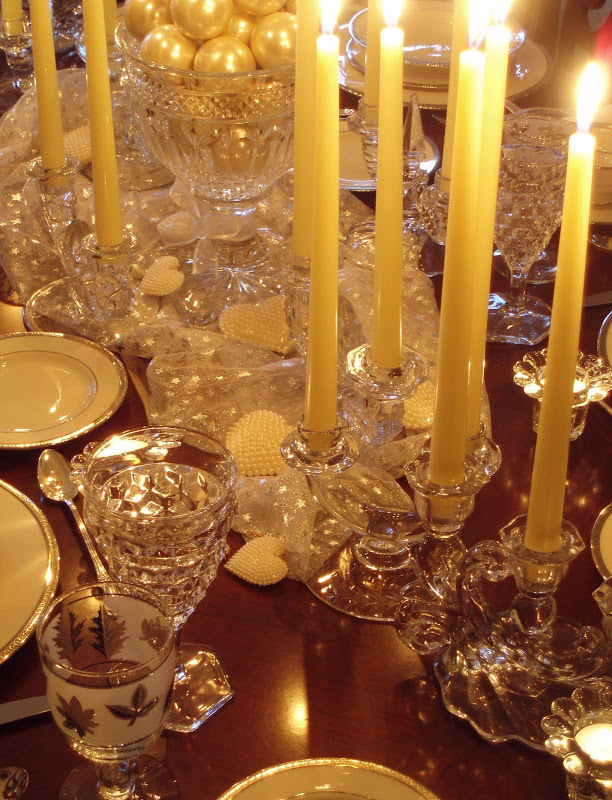 I used a variety of vintage two and three-light candleholders from the Elegant period of American glassware. Four of the patterns are by Fostoria, and one is by Cambridge. They're usually sold in pairs (at antique shops/malls and estate sales). I've found one for as little as $6 (estate sale, second day). On the left below is Cambridge Caprice. Fostoria Holly is on the right. 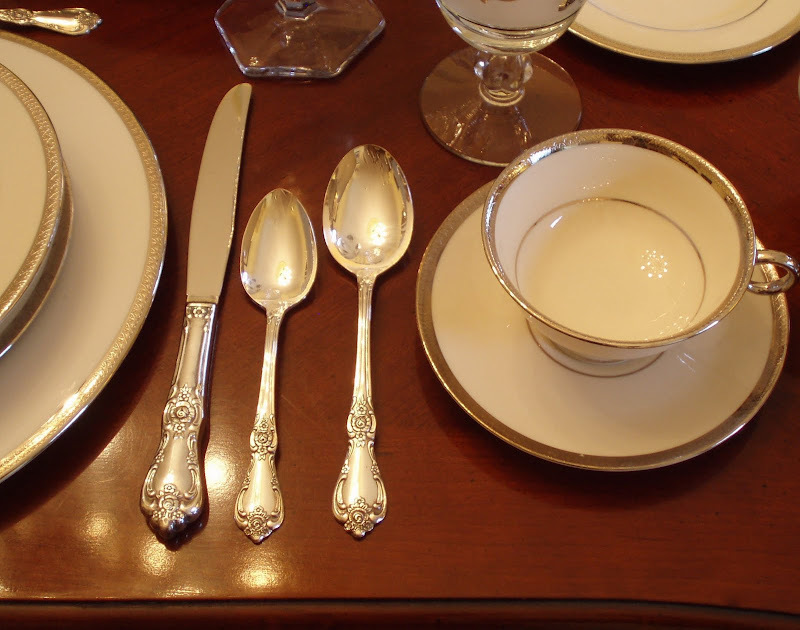 The flatware is Vanessa, a silverplated pattern by Oneida. It had a long run, manufactured from 1965 - 2006. This is an older set from a recent estate sale. It had been barely used (if at all), in the original chest, and a bargain at under $30. Who says luxury can't be affordable? The Caprice candleholder below is probably my favorite of the ones I'm using today. The candleholder in the center is Baroque by Fostoria. 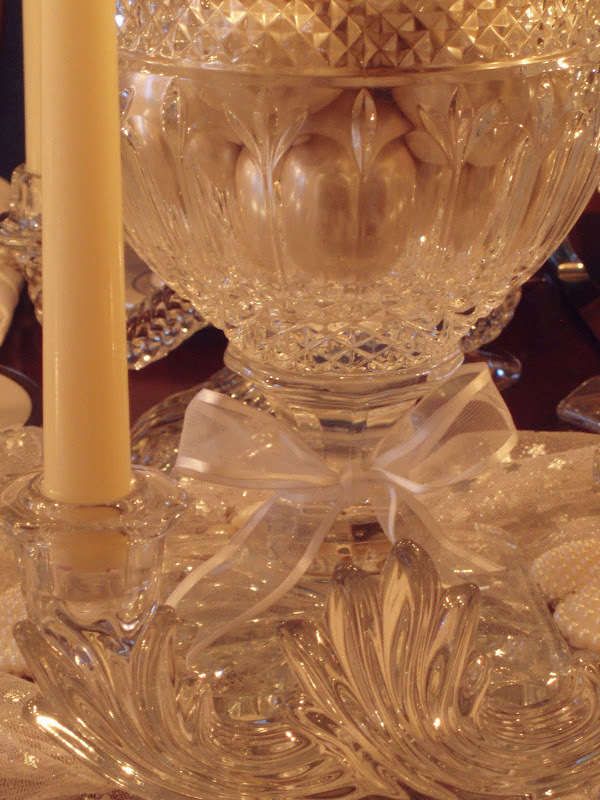 No flowers on the table today ... just a crystal compote filled with Christmas ornaments. 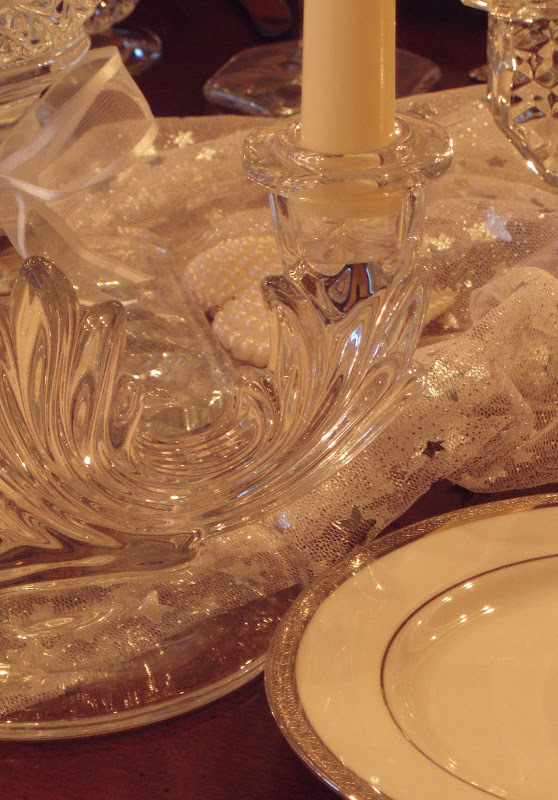 I casually placed a remnant of white tulle with silvery stars in the center of the table to add softness and interest. 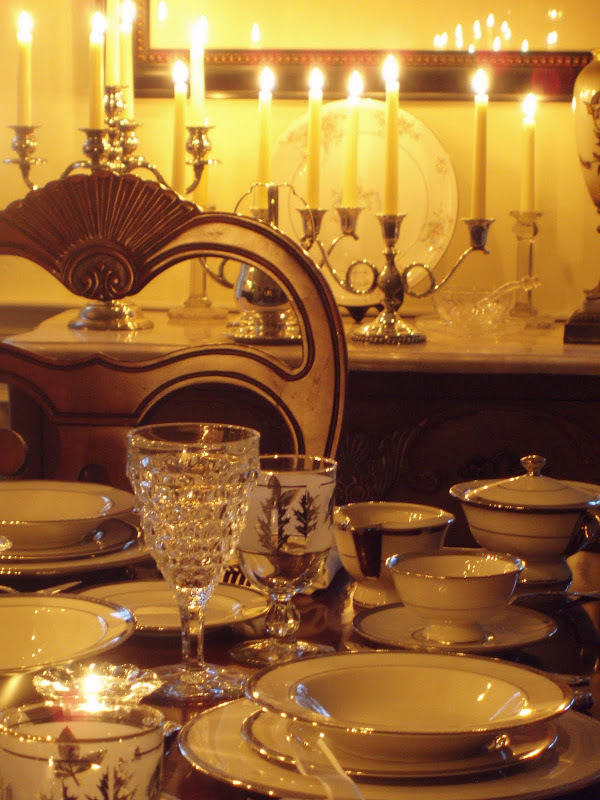 The candleholders flanking the centerpiece are Fostoria American (sometimes called Early American). 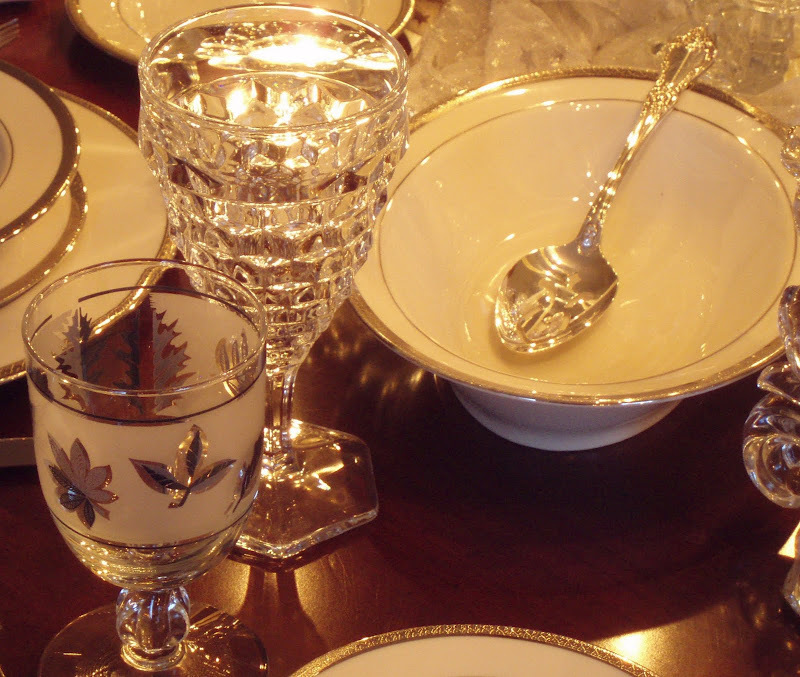 More heart-shaped ornaments surround the compote (sometimes referred to as a comport). It was on sale for only $12 at a local antique mall. The candles are now lit, providing "fire" to complement the "ice" of the crystal. 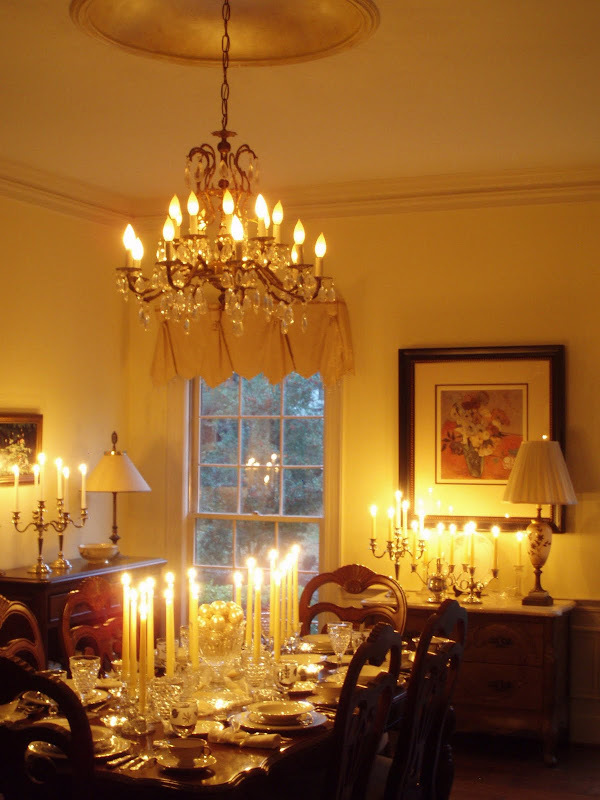 The silverplated candleholders on the Bombay chest are from the last estate sale I attended. The five-armed candlelabrum on the left was reduced to $20 on the second day, and the pair in the center ended up costing $10 (after negotiations were completed!). Even the candles were a bargain. I found them on sale at Walgreen's after Christmas last year for 80% off. The ended up costing ten cents each! I've mentioned before the my mother collected Libbey gold and silver leaf glassware (from boxes of detergent and using trading stamps). She used them often when I was a child for holidays and other special dinners. For that reason, these are as much a sentimental choice as an esthetic one for this table. They're still widely available today (usually at reasonable prices) on eBay and in antique malls. They're a fun choice for people who enjoy mid-century modern design. Shelton is described as having a "platinum encrusted" rim and platinum ring. I used it once before for a post, "Mrs. Rivards Christmas." If you missed it you can see it HERE. I find the shape of the cups to be very beautiful and graceful. 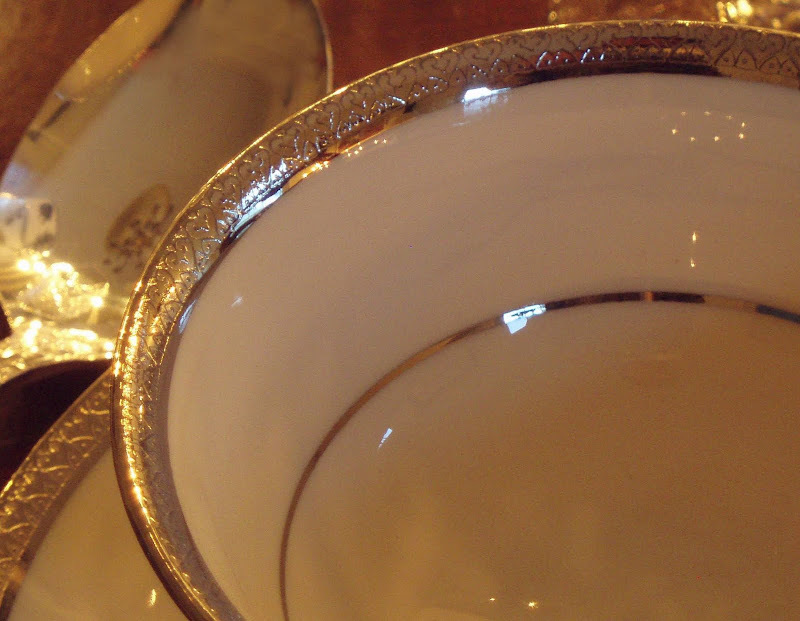 Coffee and tea just seem to taste better sipped from a thin bone china cup ... don't you agree? I see hearts in the platinum encrusted rim. Do you? The Baroque shape was used for a number of Fostoria patterns. This one is plain, but the bases were often etched with ornate designs. I tied a simple bow around the footed base of the compote, using the same white wired ribbon used to secure the rolled napkins. Glass is such a reflective surface that it rarely seems truly colorless. It reflects all the hues that surround it. Here you see the warm browns of the tabletop and the cool blue-grays of the sky outside the windows. The tealights are in leaded glass votive holders I've picked up at various thrift stores and estate sales. I've found them for as little as twenty-five cents for boxed sets of two. The heart-shaped ornaments were purchased at an after-Christmas sale at Hobby Lobby. The rimmed bowls are perfect for either soup or salads. The coffee pot on the far corner of the table is by Haviland. It's not the same pattern, but I think the color and shape work well with the rest of the china. It was an eBay find (under $20!). The candleholder in the center below is Fostoria Colony. It features a classic swirl design, and it's another of the company's sturdier patterns. I don't hesitate to put either Colony or American pieces in the dishwasher (using a good quality dishwasher detergent). 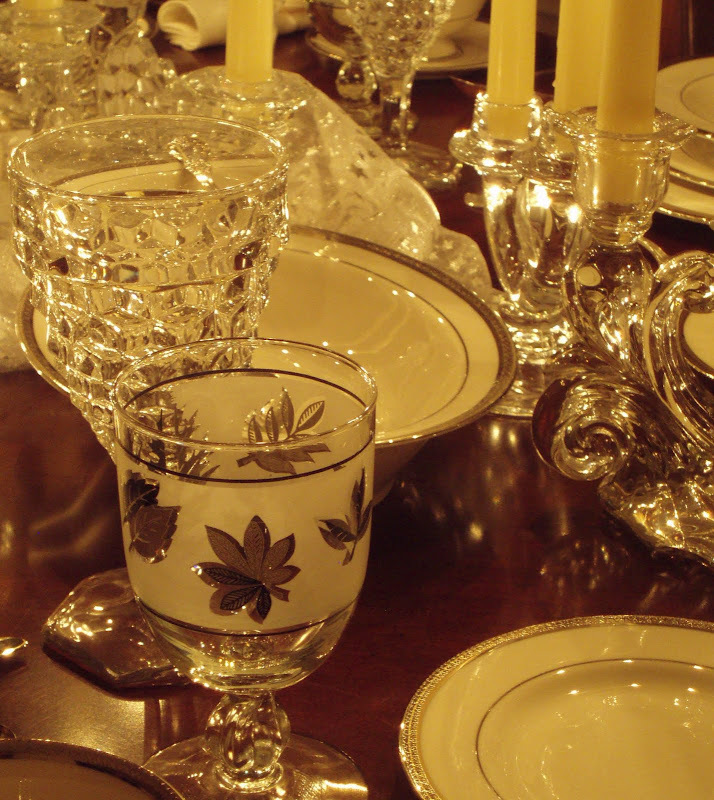 The china and the Libbey goblets are a different story ... hand washing helps keep them looking their best. I like to put a dish towel in the bottom of the sink to help prevent chips and scratches while handwashing china, crystal, and silver flatware. The chop plate (round platter) on the plate stand is another vintage Haviland pattern. I'm normally not a huge fan of flowery dishes, but I think Haviland's florals of the 1930s and 40s are among the most beautiful dishes ever created. Just another view looking down the table ... too many pictures this time? Sometimes I enjoy the juxtaposition of inexpensive items, such as the Libbey glassware, with those that were (at least originally) more costly. I thought of photoshopping the ornaments (upper right) to hide their metal caps, but I've already "confessed" their humble origins. By the time I took this shot, I'd repeatedly tried to make them look more symmetrical, causing them to roll off and go bouncing across the table. I'm getting a little weary of hearing people say, "It is what it is." But ... well ... sometimes it just IS! I hope you've enjoyed your visit. Time to blow out the candles ... and say good night. I always enjoy your tablescapes -- this table is lovely as all of them are! Love all your silver candleabras -- everything is perfect, as always. Really pretty! 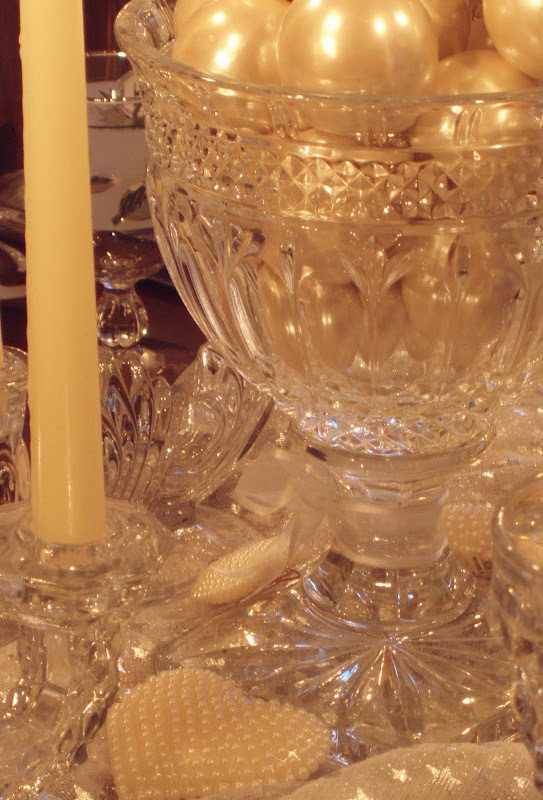 Like all the crystal...especially the gorgeous compote & candleholders. Have never seen a compote like that, and I have quite a collection. Also, I like the Libbey glasses. They look so pretty in the candlelight and just as expensive as the crystal. Bill, you are right...this table could be set for an array of holidays. It glows with romance. Love the star studded tulle and the multiple candles. 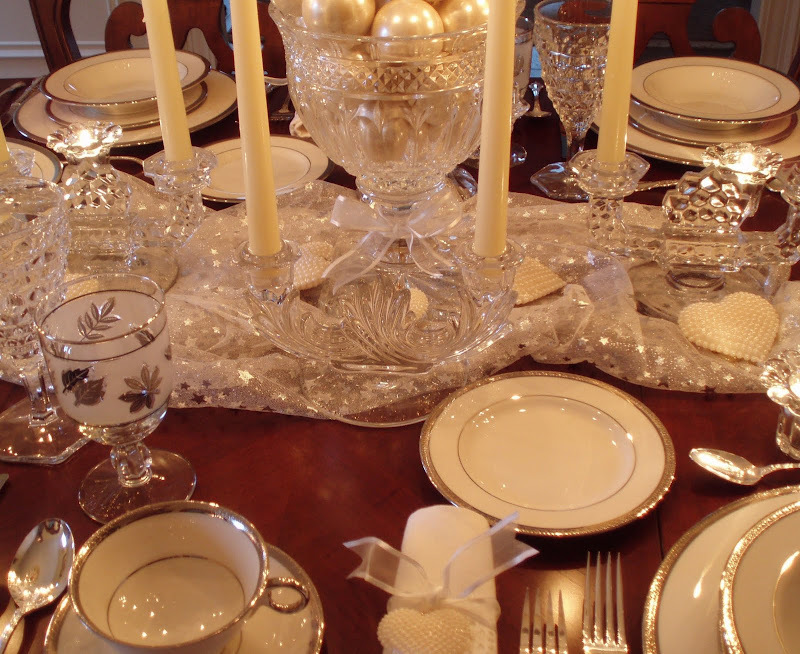 As always, this table with its elegant china, silver, and crystal is another fabulous creation. The pearl details in the ornaments and individual hearts are the perfect touch. No flowers needed on this one. Gorgeous, Bill ... and I was delighted to see the Libbey goblets. I have my Mom's Libbey Gold double old fashioned glasses -- I swear they still smell like Scotch! PS You are getting REALLY great at the photography and lighting! Stunning!! Breathtakingly beautiful. Your centerpiece is such a rich creamy color too. Wonderful! Perfect for many occasions or even Sunday dinner (if you happened to have a little extra time on your hands). My grandmother not only has the Libbey glassware (I mentioned that the last time you used it) but she also passed onto me for my wedding, her silverplate service for 12 in Oneida's Vanessa pattern in the box... pieces still in the plastic sleeves. My grandmother (nearly 93) is a woman of little means but fine taste (and she rarely entertained) so I have reaped the rewards of both in many ways. And thank you for putting a name to the face of my mother-in-laws glassware - Fosteria American. We have her double old fashioned glasses. Wow! It looks like I may finally be able to recreate one of your tables. Now, just to find the time... ;-). I love those leaf glasses (my name for them ;-) ) This table makes me think of my years in VERMONT!! As a child and teen we spent most weekends in Vermont. We had tons of snow and tons of fire (in our potbelly stove). We had glorious leaves especially in the fall. SOOOOO this tablescape smacks of Vermont to me--all the fire and ice feel and the leaves--great!! 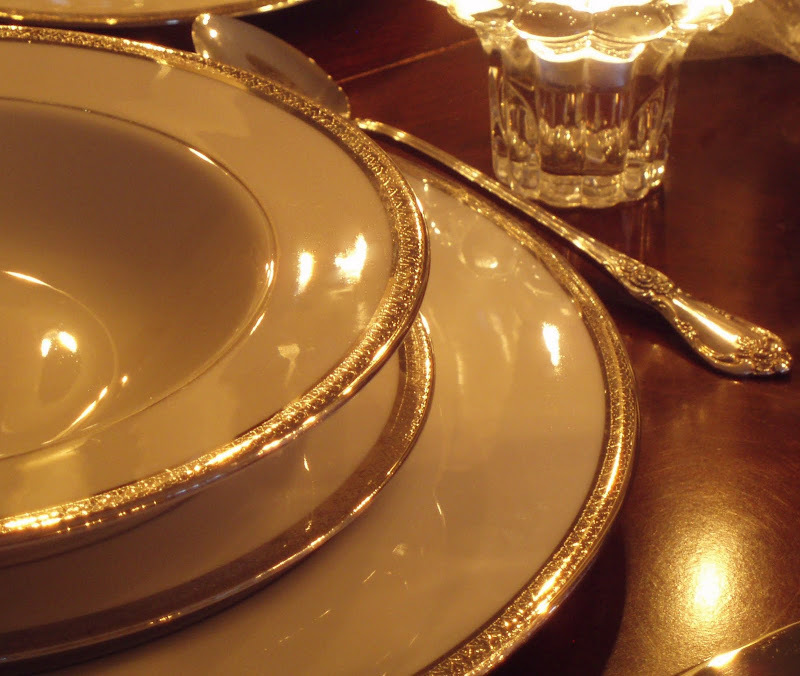 I love the shiny-ness of this tablescape! Thanks so much for the Win for me!!! ha!! Have a wonderful Christmas!! Another wonderful table. You are amazing and the photographs are wonderful. I think I need to start collecting the Fostoria goblets - they are just so classic. Absolutely perfect. Your table is gorgeous, Bill! The photography and lighting is wonderful, as usual! Well actually it is what it is and in this case it IS so beautiful. Dinner here would be such an elegant event. The wine will have to be white so as not to break up the color palette. Too many pictures. I don't think so as you know we all just eat these up. What a beautiful table. I love the layers and candles in so many different candle holders and how everything just glows! Lovely as always. Out of all your beautiful tables this one is my favorite! It's stunning! Jaw dropping....gasp! Really pretty! I'm partial to the heart ornaments. A nice touch. The flatwear reminds me of what my mom had when I was growing up - it looks exactly the same. Funny you should say "It is what it is." There was a huge debate on our local TalkRadio station a few weeks ago about saying that get on your nerves and that was one of the popular ones. LOL I hope you're doing well and have a very Merry Christmas! I get the same feeling when I am looking in one of the windows at Tiffany's Jewelry Store in Manhattan! All sparkles and elegance and I am filled with 'oohs' and 'aahs'! okay...first of all, let's get one thing straight. NEVER, EVER, TOO MANY PICTURES! I think I just spent a good 20 minutes studying each and every beautiful picture of this elegant tablescape. I will tell you that yours is the first one I always look for. And they never fail to entice me. GORGEOUS. And I think you just proved something...there are never too many lit tapers on a table. I can't wait to try out some of the ideas I have gotten for this one! Just love your tables - I inspect evey picture, there is so much to see in each. I love those Libbey glasses and am going over to ebay right now to check it out - My mom had the same ones and oh so many memories. Fire and ice is the perfect name for this table. 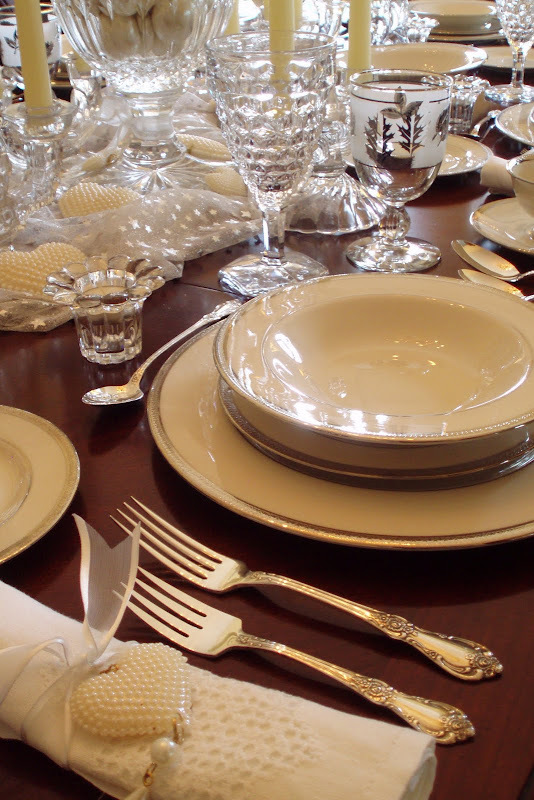 I love all the white and the silver rimmed china. Your tables are always so elegant. Merry Christmas! Ok, I know I've said this a few times but seriously, this setting is now my new favorite of all your table settings. 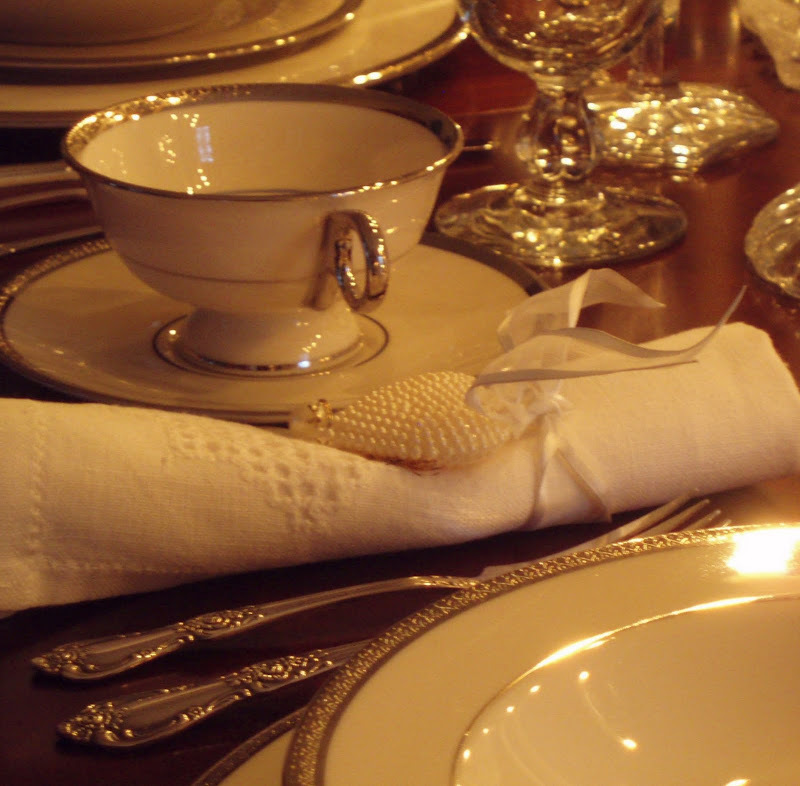 I just love love the silver rimmed china. 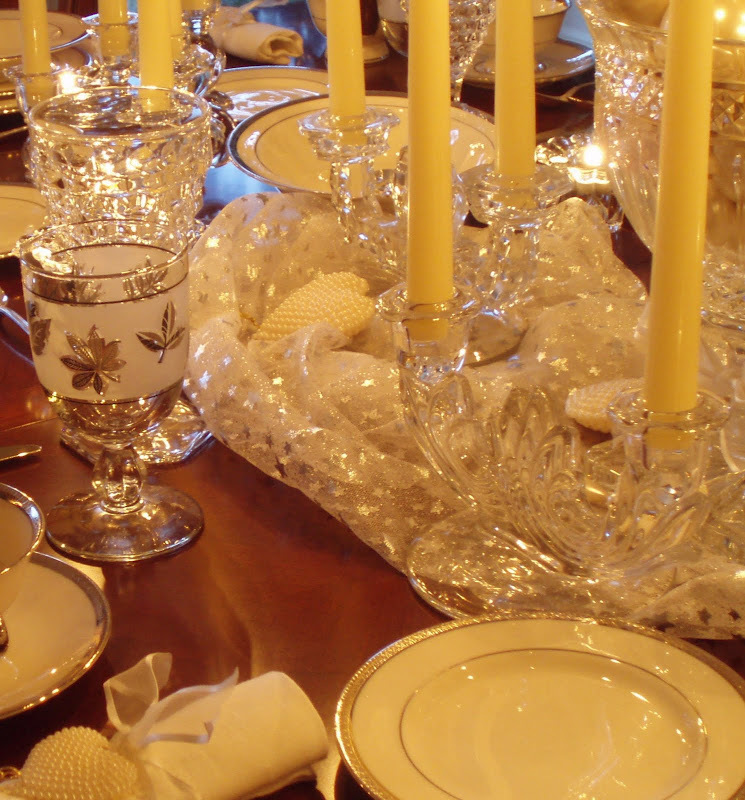 The napkin rings are elegant as are the silverware,stemware complimented with the perfect romantic lighting. Thanks again for always inspiring us. 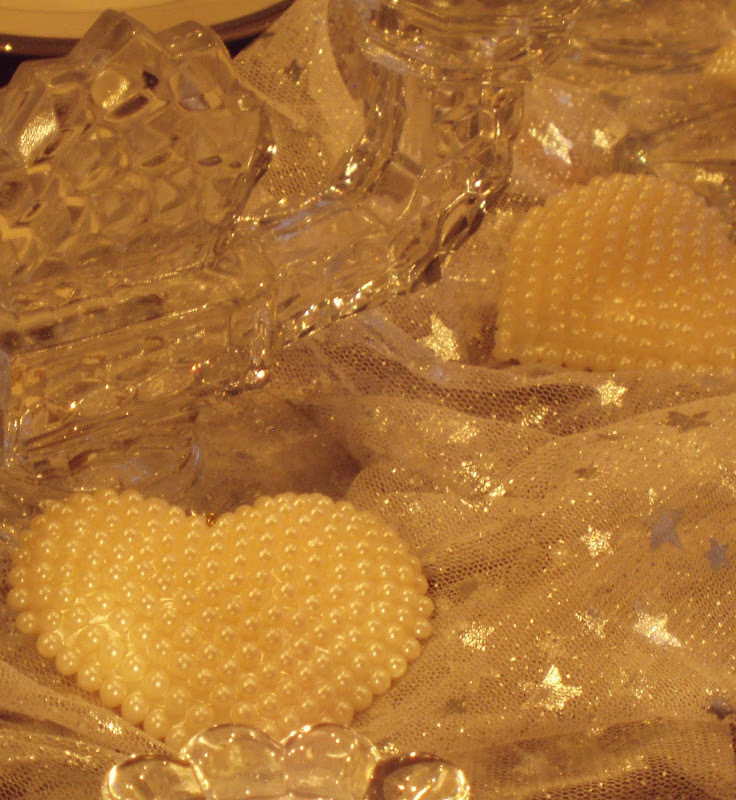 Those pearled hearts are so nice! Even the 10 cent candles. Thanks for all those pictures! Bravo, Bill! 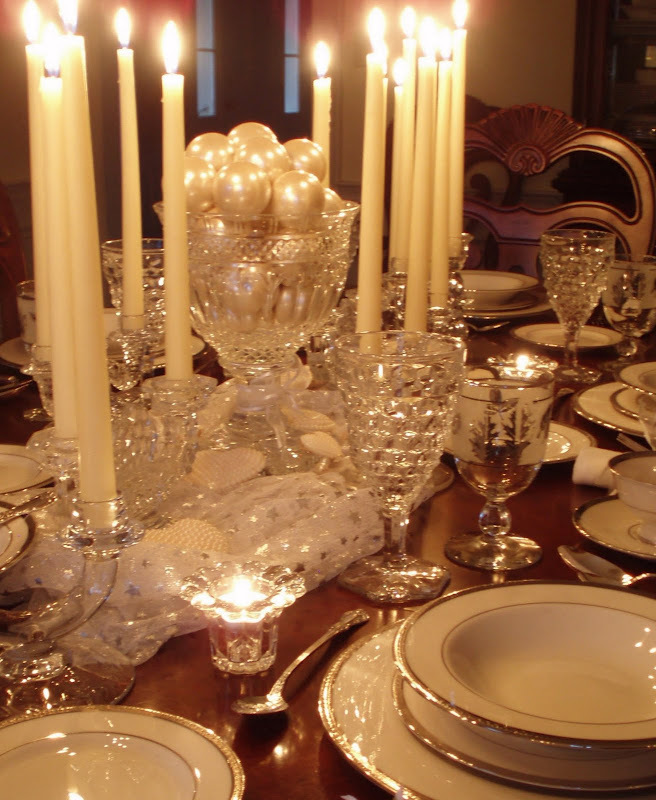 It is just the perfect Christmas table..so elegant and beautiful! I don't know how you do it!! Just wonderful! Merry Christmas, Bill, Happy Tablescapes, and good health! 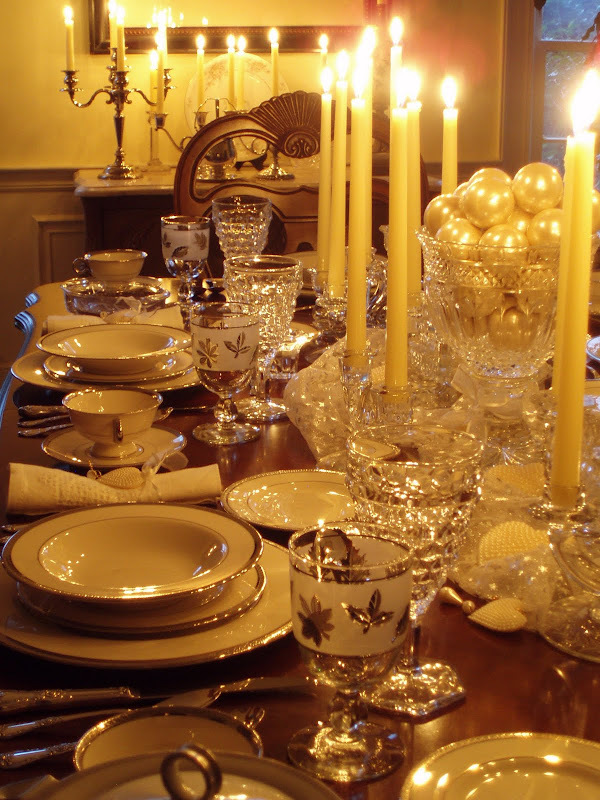 Beautiful Bill -- this tablescape is beautifully not bound to any particular holiday -- classic and classy! I agree that tea and coffee tastes different when taken from fine china cups and saucers! This is just gorgeous!! 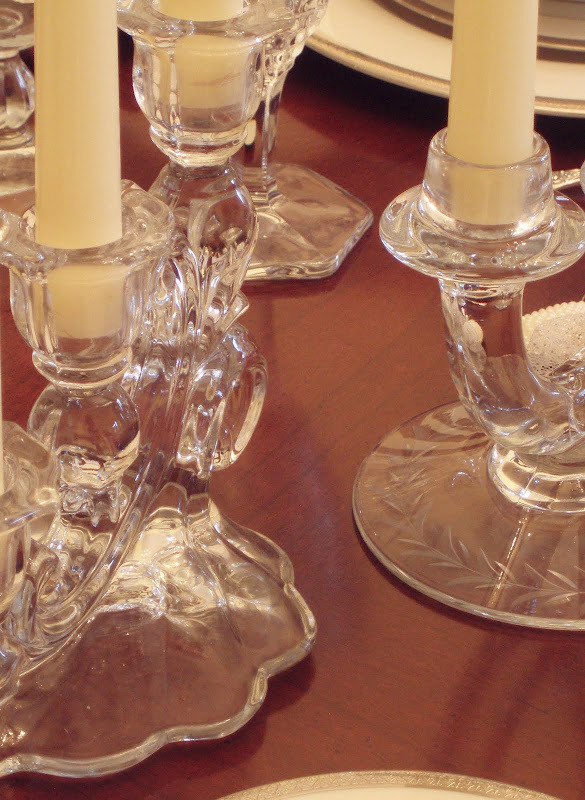 I am in love with the Fostoria candleholders and have been looking for some for a while. Gorgeous!! Stunning post! I loved all of it and NO that was not too many pictures! So elegant, even after the candles were blown out. By the way, the cactus in you last post was very elegant too. Very pretty and oh so elegant. I love all the candles and those pearl hearts are lovely. Bill-I have somehow been missing you! I am in crystal heaven here!!! You've combined two of my favorites--crystal and pearls. loved my visit. Bill, this is gorgeous. I feel as if I've been to a fabulous candlelight party. Wow! As always, you have the most beautiful tablescapes. Your photography is excellent. Thank you so much for sharing. I'll have to look again tomorrow when I'm more clear headed. Beautiful. I always love lots of candlelight. Who needs flowers when such simple candlesticks & ornaments make for an elegant centerpiece. Oh be still my ♥.......what a spectacular table, Bill! You've captured the sparkle & shine so beautifully & your attention to even the most minute detail, like repeating the hearts found in the china band with the beaded heart ornaments on the napkins was brilliant! I love every single inch of this table & your photographs of it make me green with envy over your skills with a camera. Wishing you & yours a wonderfully Blessed holiday & also congratulations to Nannykim on winning the china giveaway!!! What an amazing tablescape perfect for any celebration. The candlelight reflecting on the glass and the woodwork is truly beautiful. Fabulous! Love all the candles and hearts, two of my favorite things. Have a great day! Absolutely fab!! :o) Happy Christmas. I haven't checked in lately, but I've been looking. Boy! You sure know your "stuff". You always do such a beautiful job. And what a deal you got on those candles. Candles are so expensive. Abolutely Stunning brother!!! Merry Christmas to you!! Bill, you have done it again! Every single table you do is more wonderful than the one before. And, if I had to pick a favorite I couldn't! They are all so beautiful. Thank you for sharing your talent with us. I truly cannot express how happy your tables make me feel. Bill....your tables are ALWAYS stunning! I always look for your post to peek at first. Thank you for taking the time to share. Bill, your table is so elegant. 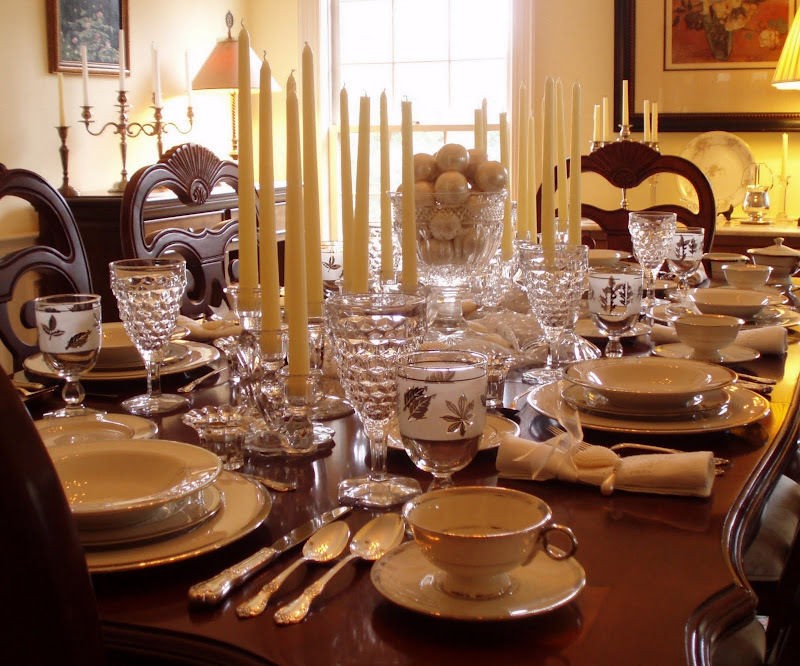 The dishware, the flatware, the glassware, the candles, the linens... everything is so beautiful. Stunning! Your table is amazing. Not only are your piece stunning by your photos really show everything off. Just lovely. I always enjoy visiting. My favorite part is when you light the candles. If you took 200 pictures of the same table, I'd look at each one carefully. Coming to your blog is so relaxing and is everything that is right with the world. Loved the pic with the lights off. Already looking forward to your next post. Another outstanding tablescape Bill! It's beautiful. I love the bowl of ornaments and the pearl hearts. Beautiful as always Bill. It's always such a treat to visit your lovely home! Bill, stunningly beautiful!! Amazing when all lit with the candles, wow! As always, your table is gorgeous! 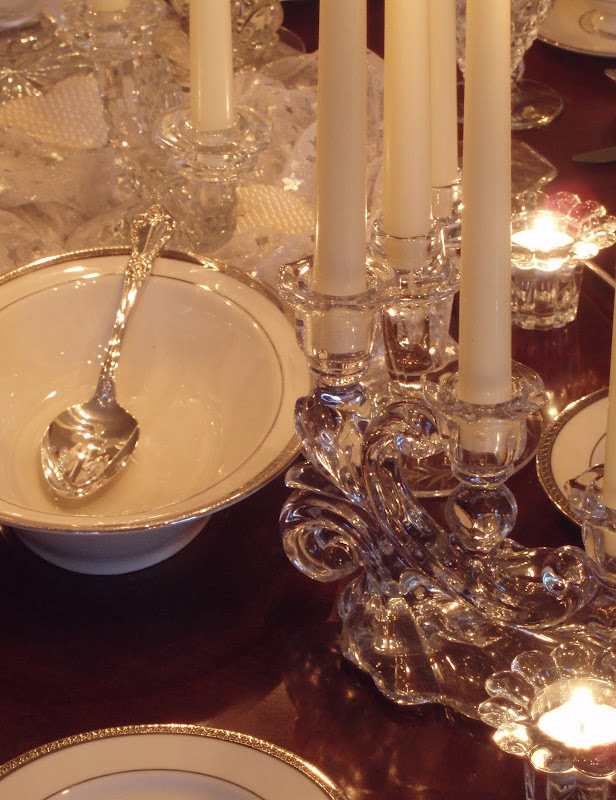 The shimmering crystal in the candlelight truly sets the mood for an elegant dinner. Cole Porter has always been my favourite to have singing in the background, I still have his original records, gosh, we have so much in common. I have been thinking about you whilst finishing my Christmas table today and all the lovely things you say and do. Thank you for being a part of my blog life this year, your very special and I hope you have a fantastic Christmas. 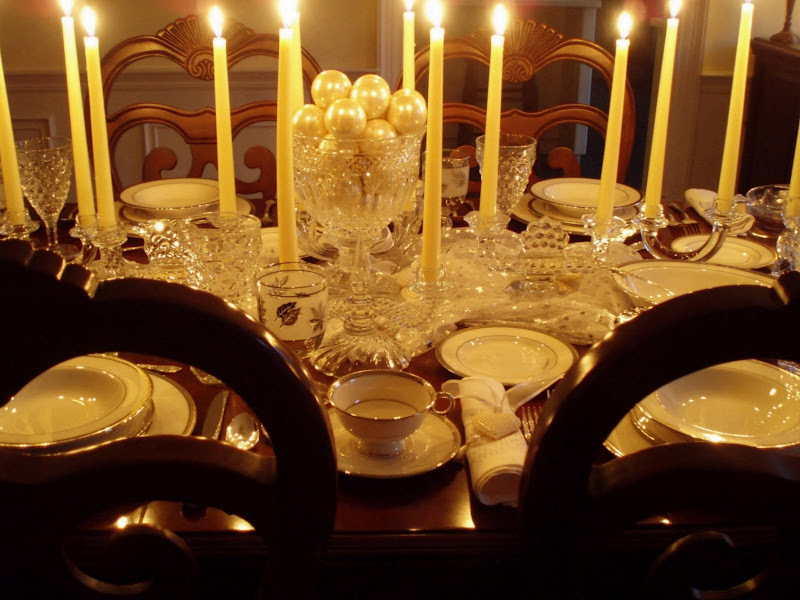 This is a beautiful tablesetting with all the candles, but I especially love the last shot above, there is something special about the end of the night when the guest have left and the table has been well loved and the candles have been blown out. Clever, clever you for capturing such a wonderful moment with your camera. Oh Bill...you're so good!!! It's so elegant and inviting! I love every single detail, and appreciate all the history you provide. In awe!!! Morning, Dear Bill! Oh, another sparkling beautiful table you've created! As Oliva said - you're so good!! Yes, you are. 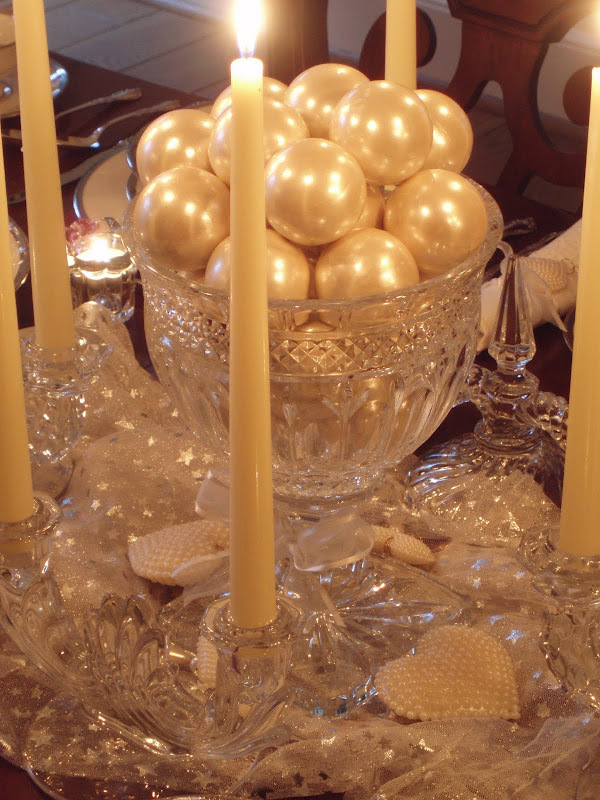 I adore that beautiful bowl with the ivory Christmas balls. Your Fostoria American is what I have, along with the Colony. I don't have these glasses, though. I do love this old pattern. 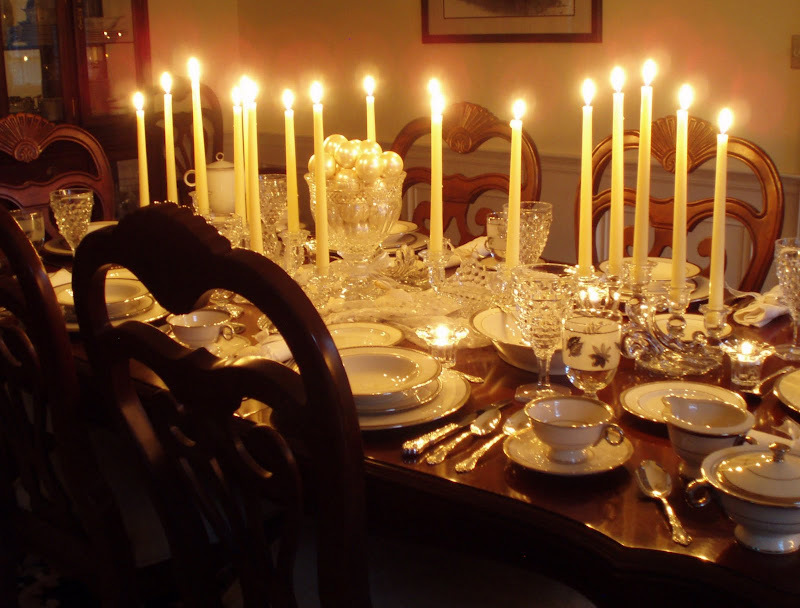 Your glowing candles look amazing on your table. Reminds me of tall trees covered with snow. I've so enjoyed getting to know you since you've entered the Land of Blog. I want to wish you and all who surround you a wonderful blessed Christmas season. I love the fire and ice tablescape. Bill, I did enjoy my visit, thank you! You set one awesome table, in case you didn't know. :) THank you for coming by & for your very kind comments. It's folks like you that keep me blogging, I sure have enjoyed it so much & sharing with all of you out there just makes it even more rewarding. Thanks for supporting me all this year, I sure wish I had more time to visit everyone, but I just cannot do it all. So, thanks for throwing me a comment here and there. :) I know time is limited for all of us. Beautiful table, Bill! Love all the candlelight! I LOVE the view out the window in one of your pics...sort of looks like it goes on forever. 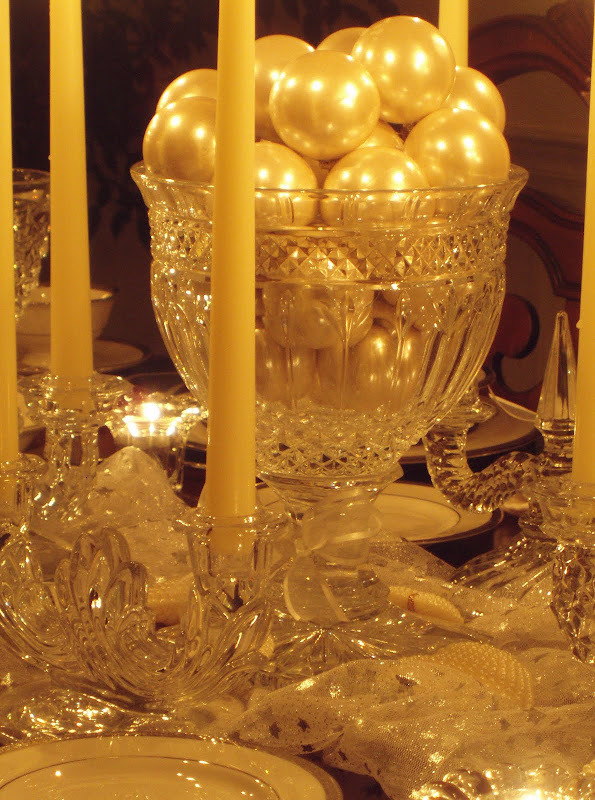 The tulle and pearl ornaments are so elegant...this would make a great Valentine's tablescape, too. 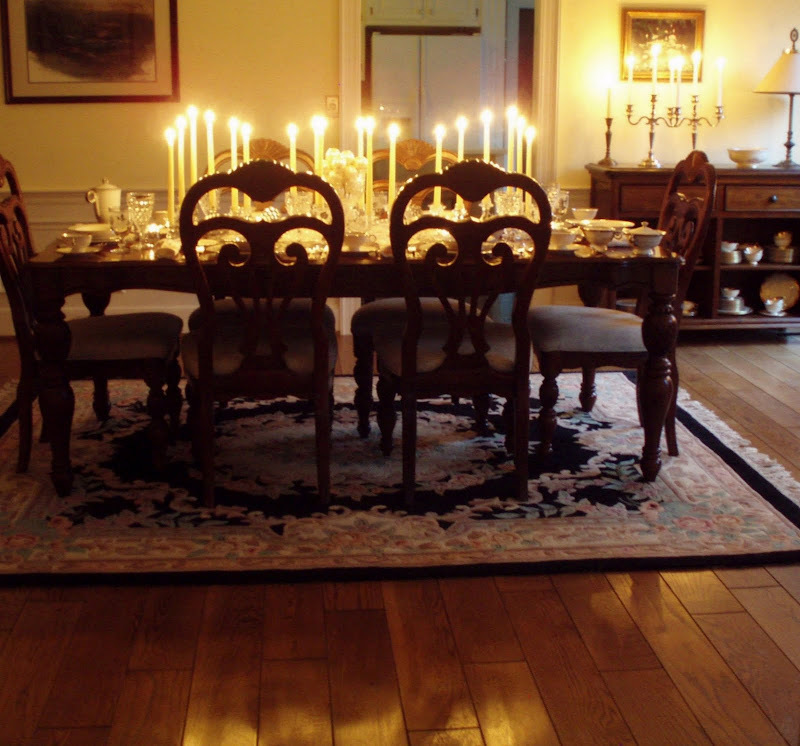 Your dining room looks huge...what a wonderful space! 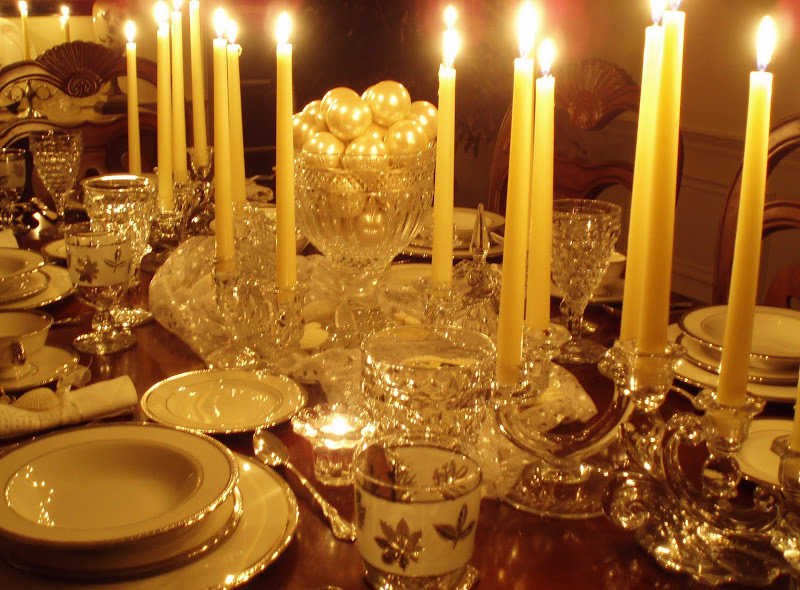 Love all the crystal and candlelight and you're right, it's best to let the warm natual wood tones anchor the tablesetting. Simply beautiful. Visiting your blog space is inspirational and educational, so much to see and appreciate. Hope the holidays are good to you and Santa adds to your collection of treasures. Your blog updates are not showing up on my reader's list again, so almost missed this. :( It would be hard to pick he best - but think this would be it. Congratulations to the winner of the china. Happy holidays! Ah! Bill! This is one of my favorite tables I've seen you do. All of the candles and the shimmery, white-on-white centerpiece with texture....so beautiful! Stunning. The pillar candles are simply breath taking in that amount. Now I'm wanting to use some in a tablescape, I've just never seen them done so well. Happy Holidays! 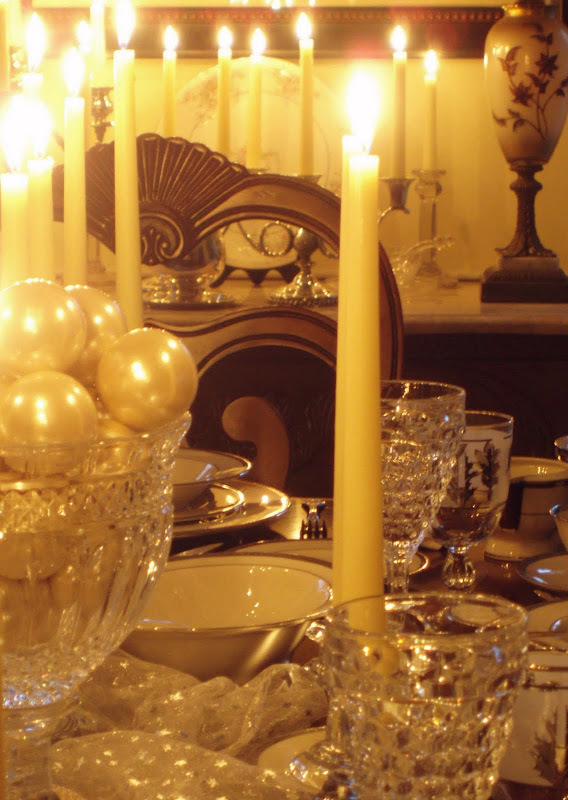 candle holders and the pearl ornaments. Bill, you set the most amazing tables! Truly elegant and stunning! Merry Christmas to you and your family. Blessings for a wonderful New Year! Hi Bill! Sorry to be so late in commenting, but I've been so behind on my blogging obligations! Your fire and ice tablescape is so dramatic!I also have a silver 5-armed candlabrum that I purchased from a flea market for $8. I hoped to use it in my Christmas tablescape but I don't own enough tapered candle holders to balance it out on the other end of my long table. Besides, if I lit that many tapered candles in my home, I'm sure the fire department would be making a house call in no time! Have a very Merry Christmas, Bill, and a healthy and prosperous New Year. Talk to you again in 2010! I really want to thank you for all the beautiful posts you do, again and again! For the energy you put into them to share with us!! I wish you a Merry Christmas and a Happy 2010! Hi Bill~ ~I lost you for a while and come to see that you were having some follower troubles. This table is stunning. All the crystal taper holders made everything just glow! They are all so beautiful. Sending wishes of Great Joy to you and yours for the holidays. Bill, I'm back for another visit to this magical table. You are a master at creating a special mood. First time I've visited your site and WOW! Incredible pictures of incredible tablescapes. Your home is just gorgeous. Hi Bill...I think this table for Chritsmas is outstanding! I love all of it, with stunnung elegance... it's "posh"...the china is superb, you are totally awesome Bill, no one can hold a candle to you! I just got sooooo very inspired by this tablescape and so I did one that I called it: White Scapes for Christmas on my blog, you're welcome to visit if you have time, I'll be honored! Merry Christmas. Boy there is nothing like candlelight to set a room off beautifully! Love all the ivory candles, makes such a statement! 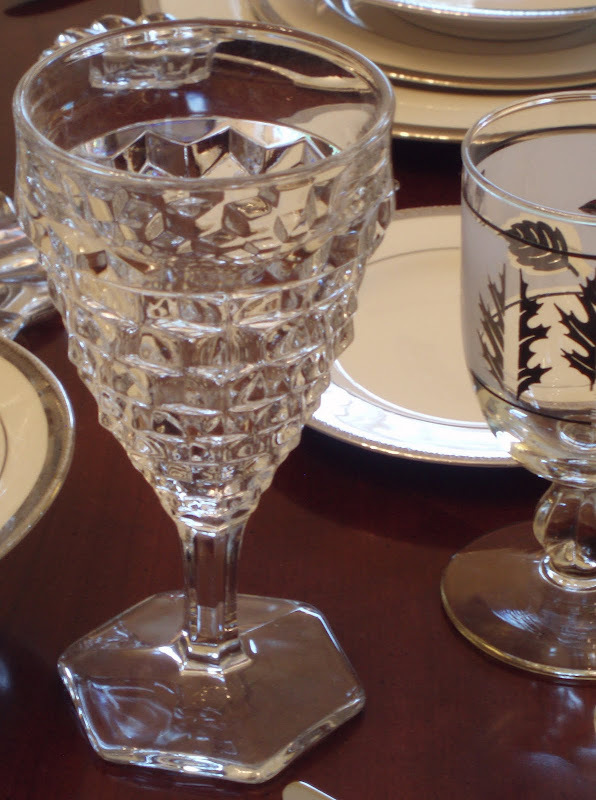 The frosted glasses with the silver leaf design on them are the same as my aunts...that brought back memories to see! I don't know their name, but I would like to have hers some day. And a Hummel New Year! Holiday Dinner! For Ten? Tomorrow?? ?